Composting | D&B Engineers and Architects, P.C. D&B has provided project design and development for facilities which compost yard wastes, wastewater sewage sludge, and the organic portion of municipal solid waste. Assignments have included design of small, outdoor municipal yard waste composting sites, enclosed yard waste composting facilities for 150 tons per day (tpd) of leaves, brush and grass clippings, a 900 tpd facility to process municipal waste into compost feedstock, and a 180 wet-tpd sludge composting facility. D&B is thoroughly familiar with commercially available composting equipment and technologies. Also, we have inspected a majority of the major US sludge and solid waste composting facilities, and several facilities in Europe. 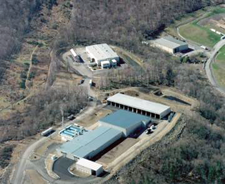 D&B managed the development of the Rockland County (New York) sludge co-composting facility that provides a full-service approach where contractors’ guarantees cover the facility’s performance. The guarantees include sludge receiving capacity, compost processing and curing capacity, compost quality, compost beneficial use, building corrosion control, and no detectable odor beyond the property line. The facility utilizes a combined scrubbing and enclosed biofiltration system to control odors. D&B fully appreciates that projects must be cost effective as measured against alternate disposal or processing options including landfilling, incineration, sludge chemical stabilization or sludge drying. Our broad experience enables us to accurately estimate project construction and operating costs thereby providing clients with the ability to make informed decisions and to balance trade-offs regarding design and operational alternatives.